« Secret ‘Sony timer’ kills products after warranty? Can Doraemon save the debt-crippled Japan Airlines? Their stocks are plunging and they are preparing to file for bankruptcy, but that's not stopping the struggling Japan Airlines (JAL) from offering travelers the opportunity to fly with Doraemon, the beloved cartoon robo-cat. According to a press release on the company website, JAL will begin operating the "Doraemon Jet" -- a Boeing 777-300 decorated with large colorful images of Doraemon characters -- on domestic routes (mainly between Tokyo Haneda, Sapporo, Itami, Nagoya, Fukuoka and Okinawa) beginning in mid-February. 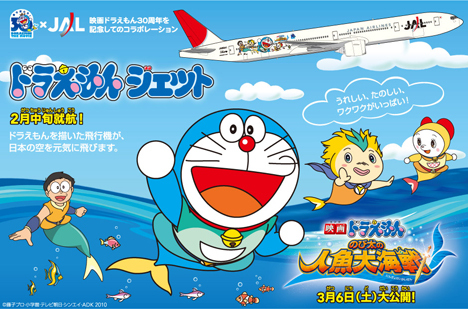 The anime-themed aircraft is the result of a joint effort between JAL and the creators of the Doraemon movies to promote this year's annual Doraemon film, Doraemon The Movie: Nobita's Great Battle of the Mermaid King (a.k.a. Doraemon The Legend), which will hit theaters on March 6. This year marks the 30th anniversary of the Doraemon movie franchise. In addition to operating the Doraemon Jet, JAL will be offering Doraemon-themed tours to Okinawa from February 15 through April 30 with daily departures from Tokyo, Osaka, Nagoya, Fukuoka and Kitakyushu. The carrier will also provide a selection of Doraemon entertainment on domestic and international flights, as well as a Doraemon kids' corner at airports and limited-edition Doraemon goods through their in-flight catalog. Our agency did the poster for this campaign. The designer was very pleasantly surprised to find his work getting noticed on an English blog. This is important for JAL. Hope for the very best for JAL. The JAL symbol at the front is very nice too, but the one at the tail wing makes no sense at all...looks like half of the hinomaru. Fix that if you can. At least the former tsuru design was well-balanced and nice. The plane is great. Marvellous we say. The design is wonderful. Amazing we say. But what about the fact that in less than a couple of months, JAL will be no more? Then what? Seems to me that the CEO has been taking a leaf out of Gordon Brown's economic policy by 'trading out of the recession'; works every time...not.